Korean shamans, or mansin, engage the sacred in two primary spatial-temporal locations—sacred mountains and personal shrines. The mansin’s own body is a third, more mobile site. This paper takes electricity, and in particular, the electric circuit, as its central metaphor. It explores shaman bodies, shrines, and mountains and the ways in which mansin experience the divine in association with these three locations as a complex connective circuitry for divine inspiration. The metaphor of electric circuitry enables an appreciation of the interconnections and interdependence between these three sites, how Korean shamanic experiences “work,” that might not otherwise be so evident. With over 15 million refugees in the world, this paper explores the ways in which refugee communities that are resettled in the U.S. reestablish religious traditions far from their original homelands. A distinction is made between cultures that practice a world religion and those that are animist or shamanic with an emphasis on the Iu-Mienh refugee community from highland Laos that lives in Portland, Oregon. This community’s traditional shamans called spirit masters utilize trance, literacy and fluency in Chinese as a sacred language to communicate with the spirit world, and Taoist rituals to control ancestral, celestial, and terrestrial spirits who influence the health and wellbeing of the living. The paper explores how the spirit masters hold an annual outdoor ceremony to manage the spirits who affect the whole community and the types of spirits propitiated. Finally, the way in which the Iu-Mienh have created a portable religious and ritual system to assist them to resettle into new locations and its implications for refugees is explored. The Kiranti are the indigenous people of the hills of East Nepal. About two hundred years ago immigration from central and western Nepal into the area started. Nowadays the region is multiethnic, the Kiranti and their oral shamanic tradition are subject to Hinduization and Nepalization. But a reverse cultural exchange happens as well, as Hindu shamans are heavily influenced by Kiranti traditions. In contemporary Nepal shamanisms become important symbols for the representation of ethnic identities, often opposed to Hinduism and Buddhism. Shamanism is a domain of cultural exchange, influenced by power relations, on the one hand and of cultural distinction, discrimination and identity-building on the other. Performances reflect these processes: in rituals, shamans get possessed by spirits and conduct soul journeys through the material environment. The expressed relations to landscape and its invisible inhabitants reveal important information about cultural conceptions. This article explores the factors of cultural exchange, memory and identity in the shamanisms of the northeastern Khotang district of East Nepal. The focus is on the process of Kirantization of local shamans belonging to Non-Kiranti groups who get possessed by spirits of Kiranti origin and hence use Kiranti language, paraphernalia and practices in their rituals. To compare ethnographic data of different societies has been an intellectual sport since the early days of the anthropological enterprise. The aims differed. Some hoped to prove the unity of human culture; others the opposite: the diversity of local cultures. Some saw in comparison the means to demonstrate the migration of ideas and practices over short and vast distances, and how these evolved from place to place. Again others voiced the conviction that the human mind, no matter where and when, came to similar conclusions, when confronted with similar challenges. Whatever people chose to compare, serious epistemological considerations were scarce. Studies in shamanism are no exception to this dissipated drive to bring data from different areas under a common roof. If a strict methodology is not offered, this essay points at least to a few domains in which comparative studies may open some attractive perspectives. These fields are: ritual practice, oral tradition, and material culture. The collapse of the socialist system, which began with the demise of the Soviet Union, has brought about the (re)structuring, or the new creation, of cultural and social bonds along religious lines in previously socialist countries. However, can it really be said that freedom of religion and faith necessarily brings about the (re)structuring of cultural and social bonds with roots in a shared religious experience? In this paper, I will address the phenomenon I describe as “a pandemic of shamans” in the Mongolian capital of Ulaanbaatar and report on the nature of the shamanism that, while building cultural and social bonds, is also fracturing and splintering those bonds. By acquiring an imaginary social position, those who become shamans overturn social relationships and fracture family bonds. Shamanism also gives rise to ethical models that differ from shaman to shaman. I will conclude by examining whether the practices of the shamans are a phenomenon unique to the post-socialist period or to shamanism in general. Indigenous prophet movements in the Americas have historically engaged the most threatening and dangerous Other, the White Man. The savants of the Northwest Amazon region of South America have mostly sought to defy the destructive power of the White Man’s knowledge by disclosing hidden, internal sources of conflict and conserving their religious traditions. A long succession of prophetic leaders from the mid-nineteenth century to the present has sustained the continuity of ancestral traditions even at great risk to the leaders’ lives. I take a multiplex, interpretive approach to these shamanic traditions, grounded in the exegesis of their ancestral practices. Field researches done so far among the Ladakhis and Tibetans indicate that the belief in shamanism has been lively preserved today along with the devotion to Tibetan Buddhism among them. For example, the Lörol ritual festival performed by the communities of Amdo Tibetans in the Repgong area of Qinghai Province cannot be quintessential without the full involvement of village shamans: it requires the presence of local deities embodied in shamans. The Ladakhis in Western Tibet have still firmly maintained the belief in shamans who embody the power of local deities and the number of those who visit shamans has never decreased. Moreover, Nechung, the Chief State Oracle of Tibet, who was possessed by Dorje Drakden, appeared during the Long-Life Empowerment and Long-Life Offering held on the last day of the Thirty-third Kalachakra Initiation July 3–14, 2014 in Leh (Ladakh), by the Dalai Lama. As this shows, the embodiment of a deity functions indeed as an occasion of making laypersons believe in its power. Thus, shamanism, diverging from local practices of village shamans to state-level practices of Nechung Oracle, has been fundamental in shaping the religious landscape among Tibetan societies. Shamanistic research among Tibetan societies so far has mostly focused on aspects of local shamans as healers or diviners. 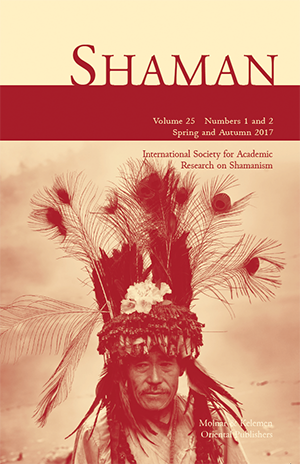 However, once shamanic practices are reappraised in terms of contemporary context of the interactions between shamans and clients/laypersons, a new role of the shaman as an agent of reconciling communal conflicts in the communities can be revealed. This paper is to explore how shamanic power works as an agent of reconciling or transforming communal conflicts on the basis of case studies of Ladakhis and Tibetans. The whole area of the Sakha Republic (Yakutia) is characterized by a good number of sacred places, in particular lakes, rivers, trees, mountains, hills, and plains. Shamans’ graves, generally placed deep inside the woods, are also considered sacred places. Almost every Sakha, before crossing a river or passing by a sacred tree or a shaman’s grave, leaves food offerings, but also cigarettes, CDs, DVDs, or small presents, and avoids speaking loudly in order to prevent attacks from the spirits or the dead shamans’ souls resting there. In the past ten years, a growing number of travel agencies have started to organize package tours to Kihilėėkh, a rocky mountain complex at the northern end of the Sakha Republic. Tourism in the Kihilėėkh mountains has recently raised many doubts and controversies. The most debated point is the question whether Kihilėėkh was a sacred place turned into a touristic spot or vice versa. Some native scholars and journalists argue that sacred places are not for the many, and therefore the mountains, sooner or later, will take their revenge. Others opine that the mountains possess healing powers: the number of people who actually improve their health after visiting Kihilėėkh is increasing. I seek in this paper to assess the creation of sacred places, their meaning, and the politics of the revival of shamanic culture in the Sakha Republic.